If you’ve been wondering where my posts have gone, it’s not that I’ve stopped writing; it’s been that I wrote a book! 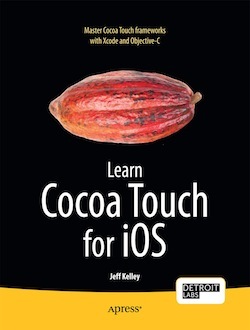 I took some of my iOS knowledge, distilled it, and turned it into Learn Cocoa Touch for iOS, which is available now from your favorite retailer (e-book versions to follow shortly). Writing a book has always been on my “bucket list,” so seeing it on Amazon is a personal achievement that I hold very dearly. That doesn’t mean that I’m resting on my laurels, however! If you’d like to get the Jeff Kelley experience in person, there are two opportunities coming soon to do so! First, I’ll be giving a talk at CoocaHeads Ann Arbor on July 12 entitled “Everything With Images in iOS.” This will chronicle using images in iOS, from the high-level UIImage class to low-level pixel modification. Second, I’ll be giving a talk at the Strange Loop conference entitled “Concurrency in iOS,” which will cover the approach iOS takes to concurrency, including operation queues, Grand Central Dispatch, and even threads. I believe tickets are sold out to Strange Loop, but if you know somebody who’s going, be sure to tell them about my session. I hope you like my book, and I hope to see some of you at these events soon!